Believe it or not, recruitment advertisements, or any advertising to fill a position in your company is very similar to how you would go about creating any other type of ad for anything else. This means many of the same rules apply. Monster also suggests that when you are creating your recruitment advertisements you should consider including information on the salary and additional key benefits that may be included in the position. There are several other simple rules to keep in mind when placing professional recruitment advertisements such as attractive subject line , short sentences, and a clear call to action. This lets your prospective audience know when and how they need to respond to the job. Placement in some cases you can request for your ad to be placed in specific location within the publication so that it is easily seen. Requesting to have your ad placed in the upper right hand corner area when running an ad in the newspaper. A reader’s eyes naturally go from the top down and view the bottom left side of the paper last. What Types of Advertising do people trust the most? 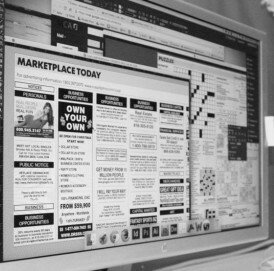 Print Advertising is still one of the most trustworthy ways of reaching High Income households.